Maple, known botanically as the Acer, is a large genus of deciduous trees and shrubs containing many species, cultivars and hybrids. Varying species of maple trees are grown and prized for their sap or syrup, richly colored fall leaves, timber, and as ornamental landscape or shade trees. Maple trees are moderate users of water and most species in the genus generally do not tolerate any measure of drought. 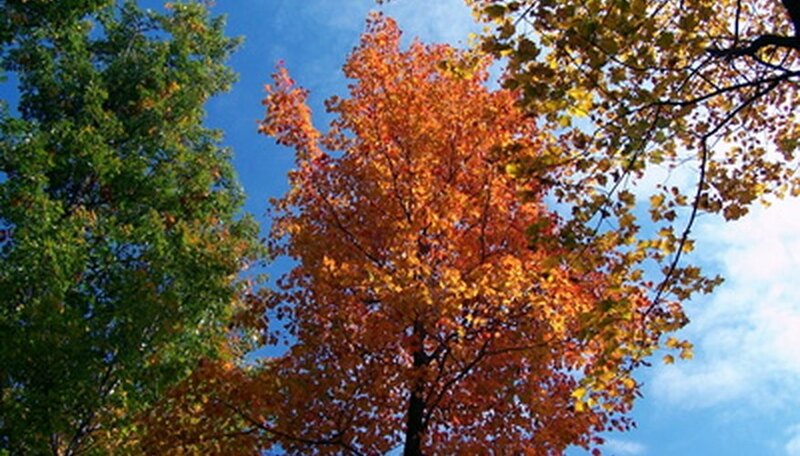 Water maple trees year-round to consistently maintain evenly moist but not soaking wet soil around the roots. Never allow the soil to dry out more than an inch or so down in the soil as drought stress is a leading determinant in susceptibility to damage and disease. Apply water in a doughnut formation around the root zone of the tree, starting at least 3 feet out from the trunk and extending to the edge of the drip line of the canopy. Apply water lowly and slowly and do not spray water onto the foliage as it can invite disease nor around the trunk as it can suffocate the roots and water log the soil at the base of the trunk. Water slowly and deeply less frequently rather than more frequently and shallowly to encourage a healthy and vigorous root system. Apply between 1 and 3 inches of water once each week. Apply considerably more water to your maple in warm weather or sandy soils and less in clay soil or rainy weather. Water maple trees slowly either overnight between 10 p.m. and 8 a.m. or in the late afternoon and evening. This will limit moisture loss due to evaporation and transpiration and the tree will be in a low stress state and can readily absorb the moisture.